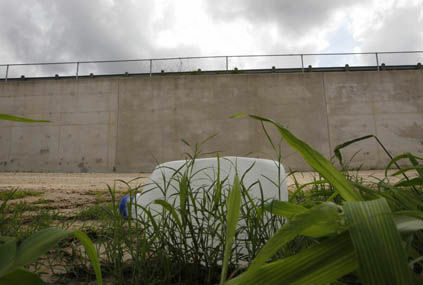 A discarded water bottle sits beneath the border wall that is built into the IBWC levee just inland of the Rio Grande on Thursday, September 29, 2017, in Hidalgo. HARLINGEN — It’s a moment many local advocates on both sides of President Donald Trump’s push for a border wall have been waiting for. Tonight, city commissioners are expected to vote on a resolution opposing the plan for a border wall. Nearly 300 area residents petitioned the city to consider the resolution, which argues the border wall would destroy native habitat critical to endangered species, Joyce Hamilton, a group leader, said yesterday. “I’m in favor of the resolution,” Mayor Chris Boswell said yesterday. Boswell, noting the city sponsors the Rio Grande Valley Birding Festival, said he believes city commissioners also oppose the border wall’s potential encroachment on native habitat. “Most of us would agree we don’t want anything to intrude on wildlife habitat,” Boswell said. Since late August, Hamilton said the group has requested Boswell and City Manager Dan Serna’s office place the resolution on the agenda of a City Commission meeting. From August to September, officials worked to finalize the city’s new budget and sought new police and firefighter contracts amid collective bargaining negotiations, Boswell said. Hamilton said the group crafted the resolution for Harlingen but also considered resolutions approved by Cameron and Hidalgo counties and 15 Valley cities.